Trump's Presidency, 2017-20?? - page 2 - news forum - Furtopia | Family Friendly Furry Forum and IRC Chat! I haven't been able to "fact check" a lot of the stuff yet, but if anybody wants to help, then you're welcome to. Trump wants to declare a presidential mandate to investigate voter fraud. In his own words. "I can garnets you. None of the votes for me were fraudulent. Only the votes for Hillary." Trump is a sick individual that should have never been allowed to run for office. Now the justus department is saying no. They will not investigate without evidence. The CIA and FBI are also questioning Trumps motives. Both Dems and Reps are questioning trumps motives. Neither party wants any part of this. By now there should be news of contacts between the new president and leaders from around the world. None have been reported. Other than the continual investigation between trumps cabinet member and the Russian ambassador. So you thought Trump's entire hateful, xenophobic platform was a joke? But that's what the people elected him on. All of his hateful rhetoric about building walls and cutting themselves off from the rest of the world, and his straight-up lies about bringing back all those long-dead factory jobs that just aren't economically feasible. i haven't really heard anything hateful/xenophobic stuff from trump. lets see the wall.. that's to stop ILLEGAL immigrants from entering America easily. i don't care what anyone else says those people are bad people since they are just skipping the line and jumping into America when other people try very hard to get here, then they start feeding off welfare without even paying taxes. deport all of them (unless they are willing to comply with the process to become a citizen, and pay taxes) those people have screwed up my life so i hope they get kicked out, and never come back unless they follow the rules everyone follows. as for the Chinese he just talks about cutting off reliance on Chinese corporations/factories. as for the factory jobs last time i checked car manufacturing, metal working, etc. are still a thing. while we might not be getting as rich off it as the Chinese we have better environmental standards, and better working conditions. But you aren't the supposed leader of the free world. He shows all the signs of someone who doesn't like reading. Doesn't ever want to talk about books, is never seen reading them, wants extremely detailed, sensitive reports condensed down into a couple of pages; the only things he likes to read are things about him. NY Magazine has been around for about fifty years so I doubt their website is sketchy. Web development is a pain in the rear and you have to cater for dozens of different browsers and resolutions. Sometimes even websites for well-established organizations can have some issues. wth does this have to do with anything? so what if I'm the president or just some random kid as long as i get the job done correctly, and on time does it really matter if i like doing something or not? again i show signs of someone who doesn't like reading yet that doesn't mean i dislike reading. "extremely detailed" reports can likely be condensed into a few pages if you remove all the pointless filler words, and useless information. maybe just like me he is tired off all the irrelevant/pointless stuff in the reports and he just wants to know whats wrong, how bad is it, how long has this been going on, etc? I'm pretty sure that these reports are filled with stuff like that, because that type of writing is all they teach in school so its likely used everywhere. is a surefire way to upset people, dude. That's a terrible thing to complain about. Even with using that 'most' qualifier people will see it as you generalizing the behavior of some minority group down to some racial stereotype. no not everyone who complains about trump is an SJW, hell i complain about him (I'm mostly annoyed about his dislike for environmental protection, but taking care of the environment is our responsibility... the government can help a little but i place most of the blame on civilians) and I'd like him to stop with the exaggerations. that's why i said in a certain area. generalizing a whole race across the earth/country is improper, generalizing a race in a city is ok to me. lets see i drive into a neighborhood in Chicago and lock my doors.. there I'm "racist" because it just so happens a lot of the crime there is from African Americans. generalizing is an important thing to do since it gives you an idea how how you should act, or how careful you should be in a certain area based on your surroundings though in no way does that mean you should be disrespectful about it. also it just so happens that stereotypes are true most of the time (or at least from my experience) hell pretty much all my experiences with African Americans within San Francisco-San Jose-LA-Oakland-Fremont are the same as those stereotypes. pretty much everyone of that skin color was sitting on the street homeless, running around swearing at each other, getting high out in public, littering/making a mess, etc. luckily i had a half African American friend years ago, seen many property acting/clothed ones (less than the others), and just have common sense that they are not all like that. but with the evidence/data iv been provided i feel its safe to assume that while not all, but most of the younger African Americans in these areas are sketchy. But it was the platform he ran on. It's what he said he'd do as president. You can't just pick out the things you liked about his platform whilst disregarding the rest of the stuff you don't like as 'talk' and things he's not gonna do. Chicago didn't even have the highest murder rate in the US last year. Also, he tweeted his threat out about five minutes after some statistics were aired on Bill O'Reilly. It's entirely possible that he literally watches TV, gets angry at it and then makes decisions based on what enrages him. Obama said he is going to fix healthcare, did he fix it? no he screwed it up more. just because someone says something doesn't mean they are going to do it. hopefully this doesn't happen with trump, though with the way trump words stuff it sounds like a joke to me. oh look Oakland, and San Francisco are on that list... most likely from those white business men, college students, and Asian tourist, right? diffidently not the sketchy looking people. though does it even matter if Chicago isn't the worst? things are still bad over there, and its a very large/old city so he should take action over there "228 shootings in 2017 with 42 killings" if this is true i am heavily disappointment in humanity. just send the feds into all of those cities... see a random black guy with a unregistered gun arrest him, see them littering arrest them, vandalizing stuff? arrest them. San Francisco is a pretty nice city though I'd likely enjoy it a lot more if it was cleaned up (hell give the ones who are willing the opportunity to clean the streets), and if i didn't feel like I'm going to get robbed/attacked in certain parts of the city because I'm white. i feel that the wall is a little exaggerated, i do believe there is going to be a wall but its likely not going to be the massive great wall of America type thing. i do not believe we will ever have a complete ban on Muslims, but i wouldn't be too against that. i do not believe all illegal immigrants will be deported, but again I'm not against the idea. i do not believe we will completely move all jobs back here, but i do believe that quite a few jobs will move back. there are lots more but iv already spend quite some time typing this. hopefully none of this stuff will happen unless trump as any other plans on how to prevent more environmental harm. though again like i said in another post its our fault if we pollute the earth more, the government cant control everything so this is our responsibility. that report seem very sketchy, i highly doubt that and if it is true which i doubt its likely on bail. sounds like a joke, but so what if he hangs it up. this doesnt really have any part in whats going to happen in the country. i have doubts that those people werent doing anything wrong. like the other one i feel that this is a fake report. but even then these people will get a trial. the cellphone thing if true is the wrong doing of the police, but i still doubt this without any proof. into a way to get rich. about him. He seems to think he can say one thing but mean another. a right to expect the truth, and a honerable person in that office. Just a few things I'd like to share and/or say. The following quotes are from Facebook that somebody had posted. "We are reliving Germany 1932. Gag order on the EPA; alternative facts; Propaganda Ministers; what a nightmare. Are his supporters still goose stepping behind this mentally disturbed fascist?" "Seems 'Fake news' is their new Sieg Heil." "All the people who elected this Clown should pay for the wall." <--- I actually agree with this one. If Trump and his supporters want this wall so bad, then let them pay for it out of their pockets. I sure as hell won't. So Trump is now silencing scientists and is in favour of horrific torture techniques coming back, such as waterboarding. The man is a monster. At the rate he's going, the rest of the world is going to rise up to stop him. Next thing you know, he'll be trying to bring back conversion therapy and concentration camps. Maybe not the latter, but I see him getting impeached and (hopefully) the American people will tell Russia to screw off. Mexico is not paying for the wall. But guess who is. What the hell is Trump's beef with climate change and/or science in general? Why does he hate science so much? Or better yet, why do Republicans hate science so much? It's not just the EPA that has had a news blackout, but I've also read of the National Park Service, the USDA, NASA, and others that have had media blackouts on their twitter accounts, Facebook pages, main websites, etc. Is this censorship or something else? What's the real goal for all this? Making the media State-run? God forbid! We need these and other agencies to keep posting climate change and other environmental data. We, as well as other countries, need this data for weather predictions and forcasting, farming, oceanography, and so much more. Without climate change data and/or science, what are we supposed to do......guess? "The press should keep their mouths shut." Great quote from anyone who doesn't want Americans to know what he's up to. The Prez of Mexico. Not a decent man by any means. Called Trump a bully and refused to speak face to face with him. Trump is threatening to cut state funding to any state or city that doesn't do what he says. Mr. Trump, please STOP with the crybaby attitude about your Inauguration crowd size. The world has heard enough about it already. Time to forget about it and move on. Your crowd size was significantly smaller than Obama's 2009 Inauguration crowd size........Period. Get used to it! Stop your whining and complaining! You lied! Spicer lied! Conway lied! 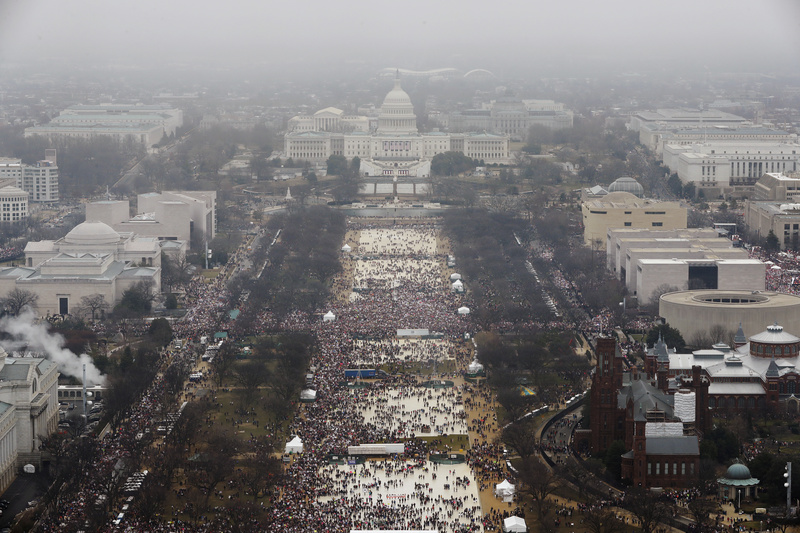 Trump 2017 Inauguration crowd size on the left. Obama 2009 Inauguration crowd size on the right. Both pics taken at the same time of about noon from the same camera angle on top of Washington Monument. unless that clock tower is broken that doesnt look like noon to me. from googling i read that the inauguration ended at 12:30 this clock looks like the photo was taken at ~1:15. iv been to concerts before and those places clear out very fast at the ending so i assume the same likely goes for the inauguration. Cite your source for your photo please, Greywolf. also i just remembered... i would like to point out that many people blocked entrances to the inauguration, so if these pictures are incorrect its likely that maybe its due to them not getting in? though i do believe that Obama's crowd was still larger. i feel the country was more united when he became president, so of course more people would be there. i haven't really heard anything hateful/xenophobic stuff from trump. lets see the wall.. that's to stop ILLEGAL immigrants from entering America easily. Were you aware that illegal immigration in the form of people jumping the border is currently at a 40 year low? It isn't the primary source of illegals coming into your country. Other things, such as people overstaying their visas, are far more widespread forms of illegal immigration which his wall will be entirely ineffectual against. So what does the wall do, other than stand as a monolithic symbol of hatred, xenophobia and soon-to-be-eroding relations with one of the US's biggest trade partners? It's going to cost billions, and whilst I'm not sure if you pay tax, there are a lot of people who do and pay a lot of it. And their money will be going to this complete and utter waste of resources and time, rather than ventures that are actually worthwhile such as improving infrastructure or funding things like health care. Because why would Mexico ever pay for it? The only people it will impact are the consumers in the US, since Mexico will simply court China because they'll be able to get a far more competitive trade agreement out of them than this isolationist Trump government that's looking out to penalise other countries for entirely made up reasons. In my opinion, even just supporting the notion of such a hateful thing is reprehensible, and I find it ludicrous that people would actually want it built considering how little it will do toward achieving its supposed goal. Your own mileage, however, may vary. How? What have they done to you? They'll simply be automated. They won't be able to compete otherwise. The many tens of thousands of uneducated people without transferrable skills won't be able to find work in a highly automated factory. wth does this have to do with anything? You don't think the leader of your country should be passionate about his job and not hate his line of work? I think I'm just gonna end this post there because I don't really want to get angry responding to the whole race thing you posted about below that. I'll just say that I fundamentally disagree with it. as for how they screwed up my life: if it werent for all this illegal immigration stuff its likely that our government/customs officers would be a little less suspicious of everyone and immigration might be a little easier. several months ago my partner got denied entry into the US and i do feel that maybe all this stuff about protecting America from illegal immigrants heavily influenced this (though i hear the 9/11 attacks also had a large effect here) America may be the one at fault here because they are the ones being very inefficient but the original cause of the problem likely came from illegal immigrants and terrorist. Who's paying for the US/Mexico border wall? Me The citizens of the U.S. will be footing the bill on this one. is trying to use common sense to fix the problems of the world. or even years to work out treaties, and agreements. many people trying to keep things fair, and equitable. those that are trying to help him. In his mind he might think they are against him. Trump continuing his undermining of the media. Call them "the opposition". Yet he continues to favor Fox new network. A known hot bed of propaganda and false information. Trump being told by both dems and reps that dropping the sanctions against Russia is a bad idea. Even talk about making these sanctions law to keep them in place. Trump had decided to have privet conversations with Mexico. I skipped a day in my last post. There's a few problems with Trump's anti-Muslim immigration policies. 1. He wants tighter vetting processes for checking on Muslims who come to the U.S.. Problem with this is that it is somewhat difficult to check on the backgrounds of people from the Middle East and/or other countries as the countries may or may not have the technology and Government/Police resources to properly check on people and then pass along that information to U.S. authorities. Some countries aren't as "advanced" as we are when it comes to computer information technology, Police forces, etc., etc. 2. Trump is giving priority to Christian refugees? One of the reasons why and how America was formed was on the principle of Freedom of Religion. People from any nationality with any religious faith should be able to come here. Since when did we start practicing religious discrimination? Oh yeah, that's right. When Trump became President. 3. By placing a ban on any Muslims from coming to the U.S., you are pretty much making a blanket ban and stereotyping ALL Muslims as bad and/or terrorists. Hasn't it already been said time after time after time by various people and organizations that not all Muslims are bad/terrorists? Only a very tiny percentage may be radical. The other 90% or so are just plain hard working people trying to make a decent living as best they can and going about their daily lives. 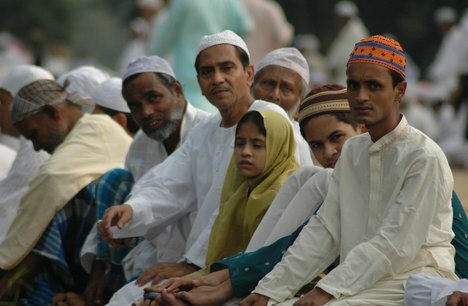 Which of the Muslims in the below pic are radical terrorists? Answer: None of them. You can't automatically say all Muslims are radical, bad, terrorists until you either get to know them and/or view their actions. Trump's vetting and immigration policies on Muslim people and Middle Eastern countries are just going to make matters worse, not better. It's going to inflame the Muslim people into more anti-US rhetoric, more anti-US violence, and especially incite ISIS and Al-Queda to make more terror threats. On a side note. Trump is still using an unsecured cell phone. AND his staff are all using privet email servers. Can you say "Jail them all".